A lovely post from my friend, Shireen, about our road trip yesterday to visit with spinning wheel guru, Alvin Ramer. Last spring, Leslie, Rayna and I went to Colbourne Ontario, to meet Mr. Alvin Ramer. 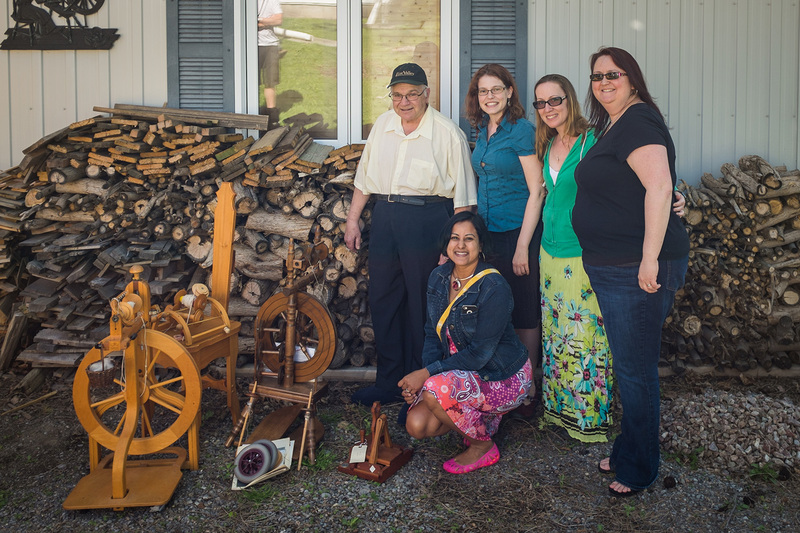 Mr. Ramer is, among many things, a spinning wheel guru, precious piece of Canadian history and, along with his wife Barbara Ann, a very wonderful person. Sadly, Mr. Ramer is retiring from the wheel business. Last weekend the three of us made another trip, to see them, and wish them well, and also to relieve them of some of the contents of their barn. Between the three of us, we walked away with 2 spinning wheels (I’m in love, more on mine later!) a spinning chair (Mr. Ramer’s prototype of his original design) and a number of little things, including combs and spindles. This entry was posted in Uncategorized and tagged alvin ramer, handspinning, shireen, spinning by Rayna. Bookmark the permalink.